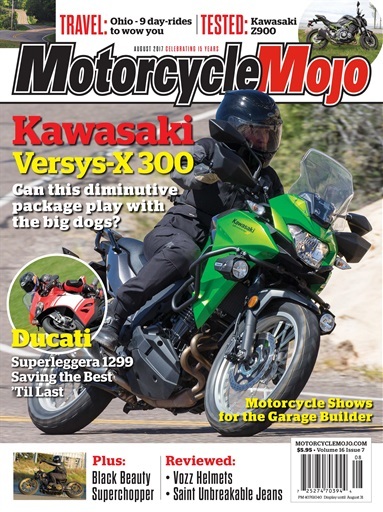 This month Mojo welcomes its newest contributor, Jamie Elvidge as she gets adventurous in Utah at the launch of the new Kawasaki Versys-X 300. Alan Cathcart does the double this month, bringing us his impressions of the first ride aboard Ducati’s exotic and ferocious 1299 Superleggera, and then he takes a spin aboard Roland Sands’ new Jekyll and Hyde ride, the SuperChopper. This month our office tester is the new Kawasaki Z900 ABS, arriving fresh faced and brimming with just the right kind of compromise. In the world of travel, we join Jeff Davison	as he’s pushed to the limits and beyond while chasing endless curves in the hills of Ohio. Then we’re headed west for two garage-build inspired bike events: First, our favourite Knucklehead David G. Williams rolls into the first annual Oil and Rust Motorcycle Show on Vancouver’s east side, after which Greg Williams tours us around Calgary’s Christine Klassen Gallery for the third edition of the IFK Kickstart Show. Last up, Jamie Elvidge shares her thoughts on this tribe of two wheels that we all belong to, and the impromptu meetings and small world stories that connect us all. 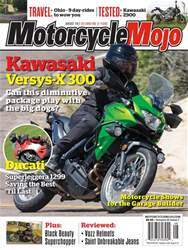 All this plus our regular columns, Mojo Garage, product reviews and much, much more in the August 2017 issue of Motorcycle Mojo.